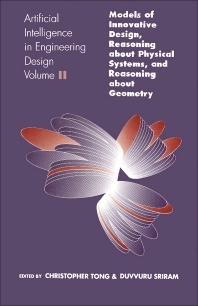 Artificial Intelligence in Engineering Design, Volume II: Models of Innovative Design, Reasoning About Physical Systems, and Reasoning About Geometry focuses on the processes, programs, techniques, and technologies involved in the employment of artificial intelligence in engineering design. The selection first takes a look at the automated reuse of design plans in BOGART and ARGO, an analogical reasoning system for solving design problems. Topics include analogy mechanisms in ARGO, analogical reasoning and learning, ARGO development environment, using VEXED to construct a design plan, and how BOGART reuses a design plan. The text then ponders on retrieval strategies in a case-based design system and case-based design, including the functions-to-structure design task in the domain of physical devices, design retrieval, proposition, and modification, and the multi-layered case representation. The publication examines mechanism comparison and classification for design; a case-based approach to the design of mechanical linkages; and studies of heuristic knowledge-based approaches for automated configuration generation and innovation. Topics include applications of stress field estimation to geometric optimization, simplification and abstraction operators, mechanism comparison and classification, linkage synthesis, analytic synthesis techniques, and system architecture. The selection is a valuable reference for readers interested in the use of artificial intelligence in engineering design. Models of Innovative Design. Reasoning About Physical Systems. Reasoning About Geometry.